This decision was rewarded when I picked up Hemingway's A Moveable Feast from another shelf. Its little, autobiographical vignettes from his years in Paris in the 1920's are exquisitely and movingly written, and are Hemingway at his very best. Having previously read The Green Hills of Africa, I think I can say that his memoirs are as great as his best novels. I was curious to learn today that Hemingway was a Catholic. He joined the Church before marrying his second wife. His work has never before struck me as particularly 'Catholic'―and perhaps this would be a misguided hermeneutic―but a glimpse is offered near the end of A Moveable Feast. When he relates how his first marriage was about to fall apart, he comments wistfully, 'All things truly wicked start from an innocence.' This is an deep paradox, and a Christian insight if there is one. Happiness, like all good gifts in life, does not guarantee its own continuation. Adam, have you seen the recent film Midnight in Paris? 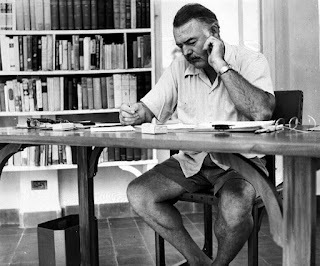 Hemingway is one of the characters, and his part is played superbly. It's a delightful film from start to finish. I did not know that he was a Catholic either. He wrote a short piece called "Today is Friday", about the centurion who stood at the Cross on Good Friday. It is worth tracking down. As for Percy, you should try The Moviegoer. I considered mentioning that I should have started with The Moviegoer, but then figured that someone would probably reply to tell me just that—and might give some more tips while he was at it. Which ended up working just as I planned … thanks for the recommendations! Great post, as delightful as finding out Charles Schulz being Catholic!